I am happy to say the new dining room is coming together nicely. I am getting my Nordic/French Cottage vibe in the room. I want to show you the cabinet done. Then I am taking a few days off. I have my granddaughter tonight for New Years Eve and then on New Years Day it is Terry's birthday and we are celebrating as a family for this special day. Friday and Saturday Terry and I are going to do some fun day trips so I am letting go of the dining room for a few days. Hope to have a reveal at the beginning of the week. Ok just to recap this was the old vintage cabinet from Terry's grandmother minus the door and drawer out before painting. After several coats of paint this cabinet kept bleeding through yellow. Suzan from Simply Vintageous to the rescue. She told me that these old pieces with the old varnish need to have a coat of Zinzer oil base shellac before painting to keep the yellow from bleeding through. So finally after adding the shellac no more yellow. Yeah!!! Love you Suzan. I call her the paint whisper!!! 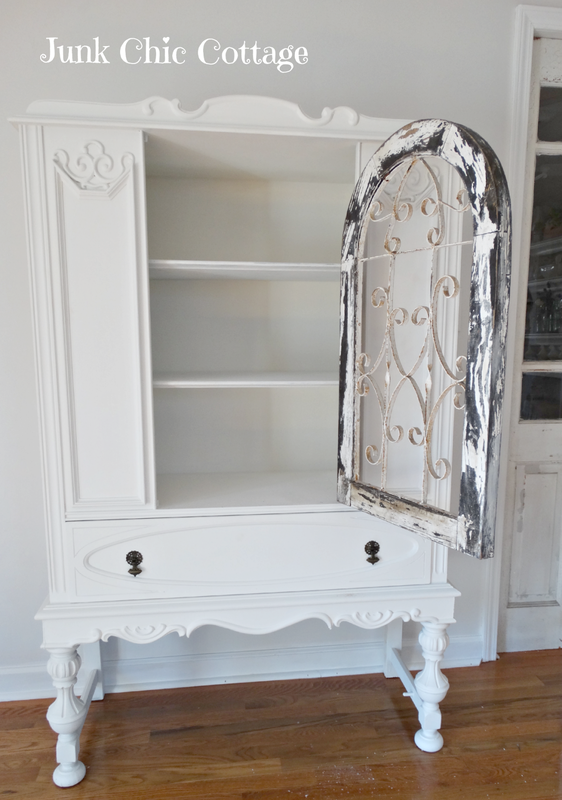 That girl can paint the ugly duckling's of furniture pieces and turn them into beautiful pieces. I remembered I had this great gate window piece that was gray and white and chippy and guess what it fit perfectly in the open space where the door on the cabinet would normally go. I did not like the cracked glass of the old door so this was a perfect fit. Wooo Hooo love that this fit in the space. Gives this old piece some pretty bling and character. Yep love that this old window will work for a new cabinet door. Gives the piece a little nordic feel. 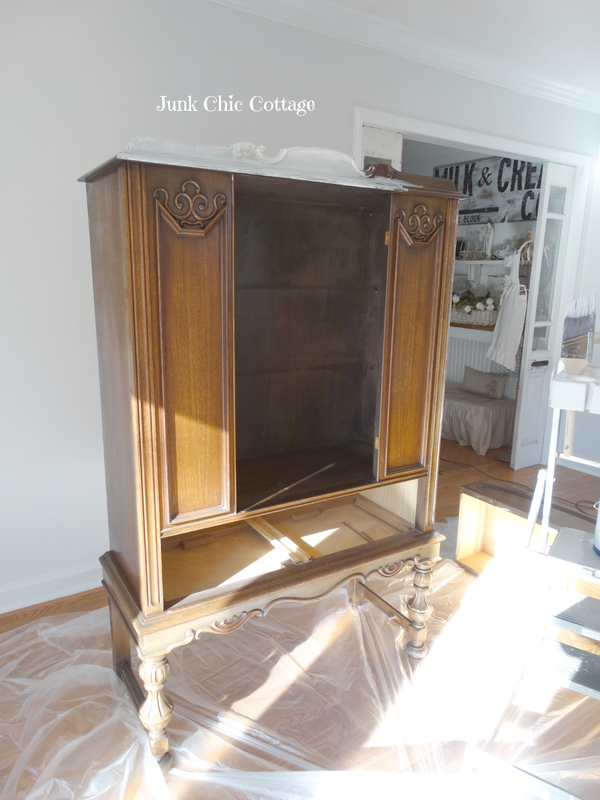 So there you have it a nice inherited piece that is re loved into a new pretty for the dining room re do. Have a wonderful New Year's Eve and New Year's Day. See you soon with the with the whole dining room reveal. 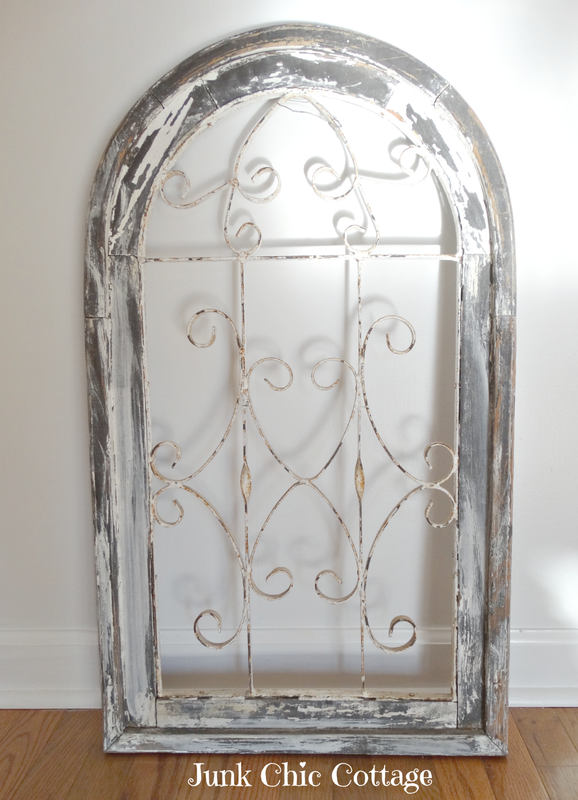 beautiful vintage piece and the arched window was meant to be! happy new years, kris! enjoy your time with abby! and happy bday to terry! Love the transformation! That piece for the door looks amazing! Happy New Year! All the best in 2015! How perfectly beautiful! LOVE the addition of that grate! Happy New Year Kris!!! Beautiful!! The old window is the perfect addition . I can't wait to see you room all redone ,which I loved it how you had it already. Oh Kris she's a BEAUTY!! The old gate for the door is fabulous! Happy New Year my friend!! What a perfect match Kris - LOVE them together - and so happy you finally have your white cabinet ! Have fun on your day trips and celebrating the birthday. Happy New Year to you! What a brilliant idea to use the window frame as a door and I never knew about the yellow bleeding through either. Great tips today. I love it. How great that the window frame fits right in. What were the odds of that happening?! 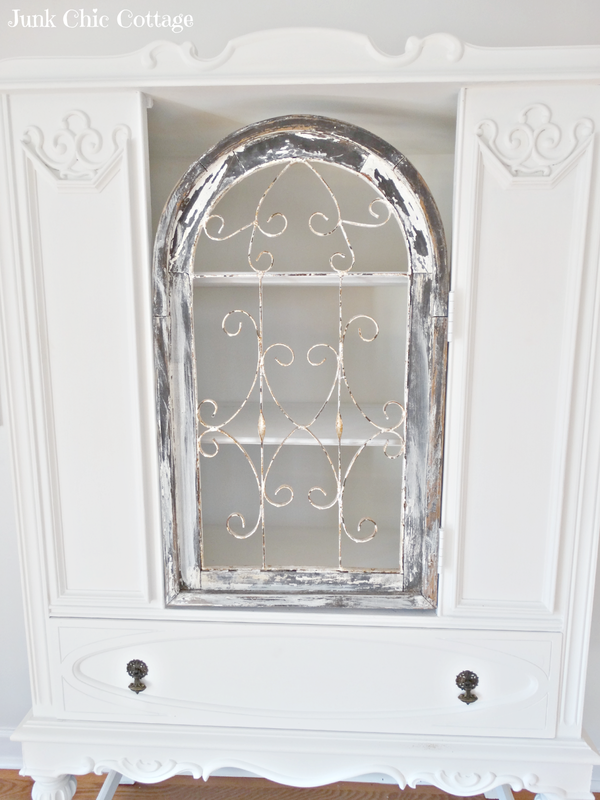 That was such a good idea to use that old window frame on that piece of furniture. Now you truly have a one of a kind piece. The hinges make it usable too. Genius! Hope you and Terry have a great vacation together and a fun New Years Eve with your granddaughter tonight. Happy New Year to a very creative lady! Kris, it's looking so good, and I love that window on the front! Suzan is awesome, so talented, and I'm glad she helped you. Best wishes for the new year - may it be filled with health and happy times for you & Terry and your entire family. Love, love, love this piece...so pretty!! Beautiful, Kris! Happy New Year! Happy New Year Kris and Happy Birthday to your lovely hubby too! Loving the cupboard's new door, how lucky that it fits. Looking forward to seeing the big reveal, but meanwhile enjoy your family time and days out. Beautiful, Kris! I'm so glad the bleed through stopped with that great tip Suzan gave you. Happy New Year Kris!! 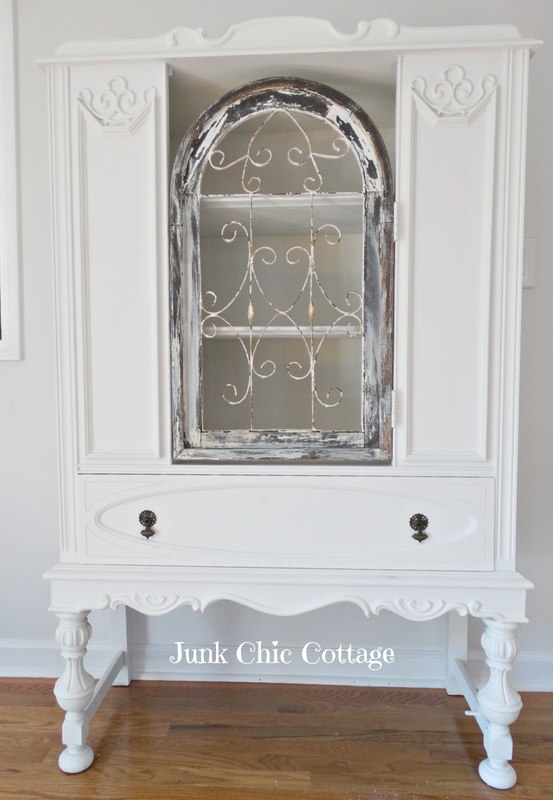 I adore your cabinet remake...oh that window is to die for. Happy New Year Kris. Thanks for all the inspiration in 2014! Can't wait to see what 2015 brings.. Your creativity rocks girlfriend! Nordic inspired dreams and seeing your restyled cabinet is sheer inspiration. Happy Birthday wishes to Terry and enjoy your break. Last night I welcomed 2015 in my jammies under a faux fur throw, sneezing and coughing into total dizziness! I wish you and Terry and your family the warmest wishes for a splendid year of love and blessings. Oh by the way, uniquely reinvented cabinet, love the new usage of a family piece. I absolutely love how this piece came out. Wow, love how the old window looks with your cabinet. Happy New Year and wishing you loads of fun during your down time! Your creativity and imagination continue to astound me. Way to go, Kris and Terry! Happy Birthday to Terry, Happy New Year to both of you. Wow Kris....gorgeous makeover and how so super creative of you to think about using that beautiful framed gate as a door!...Genius!! Happy Birthday to Terry and have a wonderful time together enjoying your day trips!! Happy New Year!!! May it be happy, healthy, and prosperous!!! The cabinet turned out beautifully! 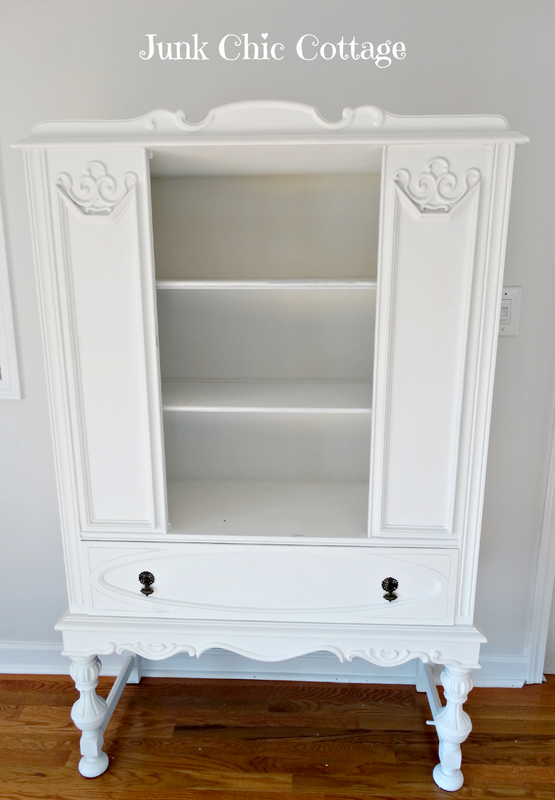 I love anything painted white! Using the window/gate for a door was so clever of you! Serendipity! Don't you just love it when 2 unrelated things join together like they were meant for each other? Your cabinet looks gorgeous! Kris, you simply amaze me with your vision! This turned out absolutely lovely! First of all...Happy Birthday, Terry!!! Hope y'all had a terrific day celebrating him! And oh my goodness...I can't believe what a perfect fit that gate window piece was! Wow! You lucked out, girl! It looks wonderful! And can I just say I LOVE the legs on that piece of furniture! I totally have a "thing" for pretty furniture legs and those gorgeous! Great idea, Kris. The marriage turned out just wonderful. Happy Birthday to your hubby and Happy New Year to all of you! Enjoy the time with your family! Love this piece and especially that door!!! Have a fun weekend! I am amazed at how beautiful you cabinet came out. I love it painted white! I hope you enjoy your new made over house. Wishing you a Happy New Year and all the best. Gorgeous restyling! The cabinet is fabulous now! I love the idea of the gate window...great idea! My heart be still! I love your new cabinet and the gate way door is an absolutely perfect touch! You did a wonderful job creating and painting this gorgeous piece! OMG, love that new door thingy. so adorable. Every now and then two pieces come together that are just meant to be. I couldn't imagine a more perfect door for your beautiful dresser make-over Kris. I'm so excited to share this with the Shabbilicious Friday party tomorrow.